BBD CEO Peter Searle and Sphere CEO Itumeleng Kgaboesele shake on the deal that makes BBD 51% black-owned. 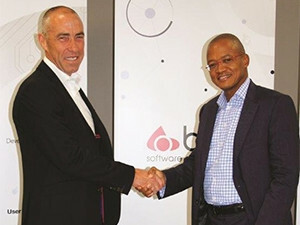 South African software developer BBD has become 51% black-owned. Longstanding black-owned investor Sphere Holdings has upped its stake in BBD by 14.2% and now owns 49.9%. An additional 1.1% has been bought by education charity, the Student Sponsorship Programme (SSP), bringing the total to 51%. BBD CEO Peter Searle says becoming majority black-owned achieves one of BBD's strategic objectives. "This a significant step forward for the ICT/software development industry in which majority black ownership remains rare. "I think this increases BBD's commercial competitiveness and in turn allows us to innovate, and attract and retain further programming talent by offering a secure and profitable pipeline of challenging work and the resources to develop skills and reward our performers," adds Searle. He would not disclose the size of Sphere's investment but called it "significant" for his R500 million-a-year turnover business. Sphere has been a major investor, and BBD board member, since 2007 and CEO Itumeleng Kgaboesele says Sphere is delighted to become the company's largest shareholder. "As a local and now majority black-owned company, BBD has some formidable new competitive advantages. Over the years, I have spoken to their many public and private sector clients who have made clear that they want to do business with high-quality, cost-effective and fully empowered local service providers," adds Kgaboesele. "It's a challenge for all businesses to meet their procurement targets. However, at the same time, we don't become competitive purely because we are black-owned, but of course it makes us more attractive given the fact that from a procurement perspective we are more attractive to deal with," says Searle. "It is also just good in a social context because it's reflecting South African society, and the targets and goals of society," he adds. Searle says the deal will have no impact on the executive structure of the business, and BBD's founders and management retain 49% ownership. "We continue to operate with the same management and leadership that we've had before, so the Sphere investment is from a non-executive perspective," he explains. The investment from SSP is also the evolution of a longstanding relationship. "We have donated and continue to donate to SSP, which is in line with our view that it is important to develop education at both senior school and tertiary levels in South Africa ? and that is exactly what they do," says Searle. SSP is an education charity which sponsors high-potential disadvantaged young people with scholarships valued at a total of R15 million. Since 2000, SSP has sponsored over 800 students to attend top schools in Cape Town, Johannesburg, Pretoria and East London. Searle says SSP's returns from investment in BBD can now be used by the charity to fund even more students. "We are really focused on becoming a much bigger IT company in the South African context and this deal will certainly help," says Searle. "Our core business strategy remains to grow organically but with slightly more acquisitive growth given that we have Sphere's expertise to guide us. Their core business is private equity and investments so they understand how to identify businesses and do the due diligence and identify if it's the right kind of businesses for us to invest in," he adds. "Supporting the critical ICT infrastructure behind many of South Africa's largest public and private sector companies is an exciting and good business to be in. We will build on our nine-year winning formula of working with BBD management to grow the business," adds Kgaboesele. BBD's software, apps, systems and services power SA's public sector organisations, including SARS, National Treasury, the IEC, Home Affairs and the South African Reserve Bank. Private sector clients include Discovery, Standard Bank, Sanlam, Nedbank, Absa and Vodacom. Searle says despite South Africa's current "economic gloom", BBD remains positive about its growth going forward. "Because BBD's software infrastructure supports the critical functions of state and private sector, and delivers efficiencies, market demand remains high even through a downturn. "The next phase of BBD's growth as a black-owned company will be to expand into other international markets while continuing to use local expertise. As for global expansion, our Africa business will remain linked to the needs of current corporate clients on the continent, while we will increase the work we do in the UK and European business," says Searle. Sphere is a diversified black-controlled and managed investment holding company. It is led by Kgaboesele, as CEO, along with executive chairman Jabu Mabuza - who is also chairman of Telkom SA. Founded in 1984, BBD is South Africa's largest independent custom software development company, employing over 550 software developers.